AB Commander is a powerful yet easy to use utility that lets you manage your files and folders using the convenient dual-panel user interface (pioneered in Norton Commander), while maintaining close integration with the standard Windows shell. · Copy and move files and folders from one folder to another without the need to open two separate Explorer windows: AB Commander shows the source and destination folders side by side, and you can see the results of the operations instantly. 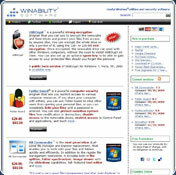 · Quickly navigate between the folders on your computer or LAN, using the history lists, pop-up folder tree window, Drive bar and other navigation tools. · Quickly preview images located anywhere (not just those in the My Pictures folder), without opening the imaging software and waiting for it to load. You can view many images as a slide show, too! · Make a list of files that you can print out or import into a spreadsheet for further analysis. · Compare the contents of the folders displayed in the opposite panels by the last modification time of the files, their size, etc. · Synchronize folders, by automatically copying only the files that have been updated by you. You can use this command to periodically backup your documents, or to quickly copy them between your laptop and the desktop computers, making sure both of them will have the most up-to-date versions of your documents. · Split a large file into smaller segments and merge tts and merge ack into the original file. You can use this command, for instance, to span a large file across several removable disks of a smaller size. · Create filters to display only the files you want. This command can save you time when you work with folders that have a lot of files of many different types. · Quickly view or edit the DOS, UNIX, and UNICODE text files with the built-in Quick Editor, without the need to wait for a dedicated text processor to load. · Many options to change the look and feel of the program, such as custom colors, fonts, and effects, which you can choose to suit your personal working style and preferences. You cannot download any crack or serial number for AB Commander on this page. Every software that you are able to download on our site is legal. There is no crack, serial number, hack or activation key for AB Commander present here. Our collection also doesn't contain any keygens, because keygen programs are being used in illegal ways which we do not support. All software that you can find here is freely downloadable and legal. AB Commander installation package is prepared to be downloaded from our fast download servers. It is checked for possible viruses and is proven to be 100% clean and safe. Various leading antiviruses have been used to test AB Commander, if it contains any viruses. No infections have been found and downloading AB Commander is completelly problem free because of that reason. Our experts on malware detection tested AB Commander with various spyware and malware detection programs, including fyxm.net custom malware and spyware detection, and absolutelly no malware or spyware was found in AB Commander. All software that you can find on our servers, including AB Commander, is either freeware, shareware or open-source, some of the software packages are demo, trial or patch versions and if possible (public domain licence), we also host official full versions of software. Because we want to be one of the fastest download sites on the web, we host all the software including AB Commander on our servers. You cannot find here any torrents or download links that would lead you to dangerous sites.